That proud symbol of Britishness, the local pub, is under threat. For many, pubs are a ‘third place’, somewhere away from the constraints of work and home, a place where people go to meet friends, go on dates, kill time or drown their sorrows. Many locals have their own character – that chirpy barman, the weird animal head on the wall, a certain beer that you can’t seem to get anywhere else. Pubs are great. But they’re disappearing at an alarming rate. The Campaign for Real Ale (CAMRA) estimates that 29 pubs close across the UK every week. That’s more than four a day. Sometimes it doesn’t make too much of a difference – it wasn’t that good anyway, the locals find a new pub, everyone starts buying beer again and they’re happy. The Queen Victoria, at 72 Barnet Grove, E2. It closed in 1993, and has now been turned into some very fancy flats. A lot of the time, it can kill a community. A rural village where the pub is the town hall, collective living room and therapist’s couch can find itself without an identity. The closing of a legendary gay pub, like The Joiner’s Arms on Hackney Road in east London, can leave a marginalised group without a collective space to call their own. Every time a local pub closes, the world becomes a slightly greyer, less interesting place. Pubs can close for a variety of reasons. Sometimes, rising rents can leave owners unable to pay for the pub any more. Property development and gentrification can result in a street corner hard man’s boozer finding itself in the middle of the country’s trendiest neighbourhood. Sometimes, changing demographics and societal tastes can just mean people just aren’t drinking in pubs as much. All of these factors have hit east London’s watering holes hard. Click this image to see the full interactive map. 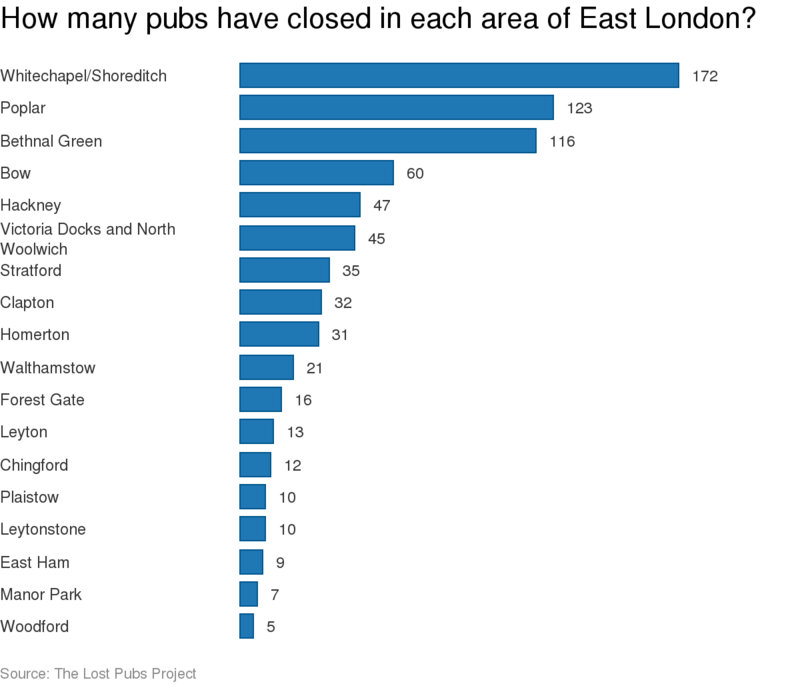 The Lost Pubs Project, a user-generated database of closed pubs across the country, has a list of around 762 closed pubs in east London alone. Some of these closed in the early 20th Century, and provide browsers with interesting historical tidbits about the places that the East End’s men (and it was always men) liked to have a drink after a long day. Most of the listings give a much less halcyon image of the state of London’s pubs. Since the millennium, more than 268 pubs have closed in east London. That’s more than twice as many closed in the previous period, from 1985 to 1999. Each area has been affected, but the E1 postcode area, which takes in the hyper-developed hipster hangouts of Shoreditch, Hoxton and Whitechapel has seen the most closures, with around 44 pubs shutting their doors since 2000. The highly developed areas of Shoreditch and Whitechapel have been the most affected by pub closures over the last century. Recent decades have seen Shoreditch turn from a fairly normal working class East End neighbourhood, into an underground enclave for artists and alternative communities, into a full-blown Disneyland of hipsterdom. The area has always been a place for artists and outsiders. The first playhouse in England was built on Curtain Road (not too far from The British Lion, closed in 2012), and the area was well-known for its host of theatres and music halls during the Victorian period. Attracted by low rents, artists and alternative folk moved began moving into the area in the late 1980s. The media picked up on the trendy community living there in the mid-90s, edgy celebs started hanging round Hoxton Square and Old Street, and the prestige and rents of the area started shooting up. There’s plenty of places to get a drink now, but they’re not the familiar community places that are being hit by closures. There’s hundreds of places selling east coast American craft beers and organic ciders, but they’re self-conciously trying to be cool, walls adorned with neon lights and faux Americana. You can drink shots of imported Mezcal at a tiny bar underneath a kebab shop (seriously, it’s called Quiquiriqui, 184 Hackney Road), but a hundred metres up the road the dilapidated Durham Arms sits empty, boarded up since it closed in 2008. Someone who knows the pain of pub closure is Jon Ward, co-chair of the Friends of The Joiner’s Arms, a campaigning group fighting to save the famous gay pub and radical space on Hackney Road. The pub was closed in January 2015, when the company that owned the pub decided to put the pub up for sale. Property developers currently have their eyes on it, and anyone who would be able to turn the site into flats would make a lot of money. The Friends of the Joiner’s are currently fighting to save the space, and have been succeeded in getting the pub Asset of Community Value (ACV) status. It’s a legal recognition that the space is valuable to the community, and one that gives them the right to have a say in what happens to it – it also ensures that they have the right to bid on it if it goes up for sale, and allows them time to raise the money. Jon said that he never really understood the difficulties that small, independent pubs were up against before he got involved with the campaign. The people at the Joiner’s are in a good position, with their legal recognition, and most importantly, incredible will to keep fighting. However, many other pubs in the area haven’t been that lucky. Predominantly a working-class area, Jon says that pubs, which can struggle at the best of times, are easy targets for developers. For the people who drank there, the Joiner’s was far more than just a place to drink beer. It was an accepting, friendly, radical place. Known as one of London’s boldest, proudest gay bars, it probably doesn’t have much in common with the now-dead boozers further up in Hackney or Walthamstow. But the spirit, and the importance it had to the people who went there, is exactly the same. 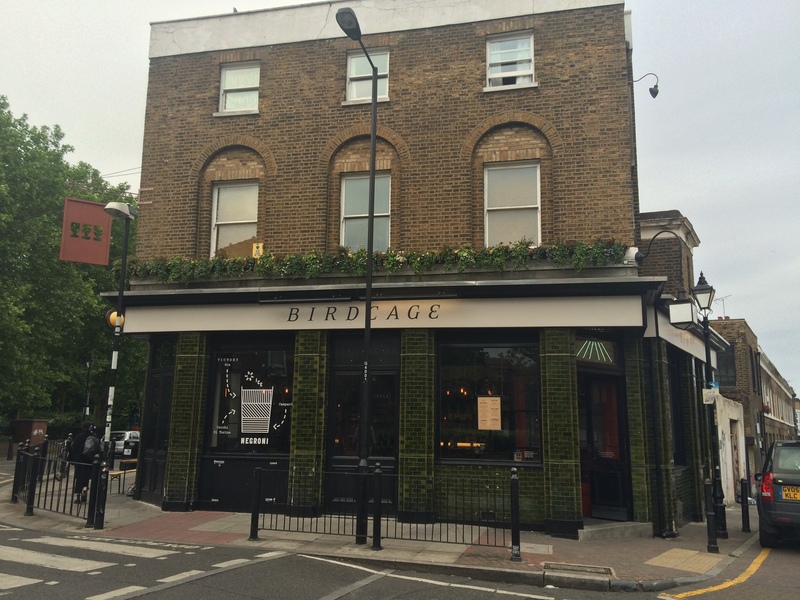 The Birdcage, 80 Columbia Road, E2. Closed in 2014, and reopened a few months later with a hip new look. For some, the tide is turning. The gang at the Joiner’s is in the long and boring process of setting themselves up as a community benefit society, which will allow them to run the pub as a co-operative when (hopefully) it opens. Other pubs have had similar success stories, although not many. 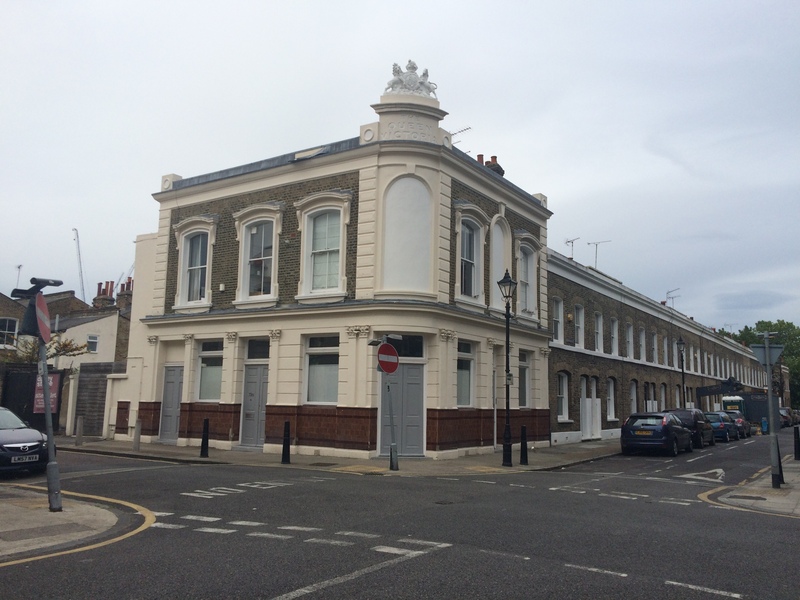 The Ivy House in Nunhead became the first co-operative pub in London in 2013, after going through a very similar ordeal as the Joiner’s – the company that owned the pub wanted to sell it to property developers, and gave the business a week to clear out. Locals and staff clubbed together, got their ACV status, and bought the pub. Now it’s a thriving business once more, owned and operated by the people who work there. It’s unfortunately unrealistic to hope that every closed pub in London could be taken over by a motley band of regulars and revived once more. Pub is the Hub is a not-for-profit that offers advice and assistance to communities looking to do just this. It can be a difficult task, and the realities of running a business often don’t come to people’s minds when they think about being a pub landlord. In fact, Lisa Harlow, spokeswoman for Pub is the Hub, says the group spends a lot of time trying to ‘talk down’ potential owners, who don’t fully grasp the realities of running a pub. So difficult, in fact, that around 50 per cent of community-owned pubs close within a year of re-opening – often delivering a double blow to the communities that they serve. Only time will tell if the Joiner’s will survive in its new incarnation. Judging by the huge outpouring of grief at the unexpected and premature closure (the Joiner’s was always busy and completely rammed at weekends before it closed), it’ll get on fine. But for the rest of east London’s closed pubs, the picture looks a little bleaker. 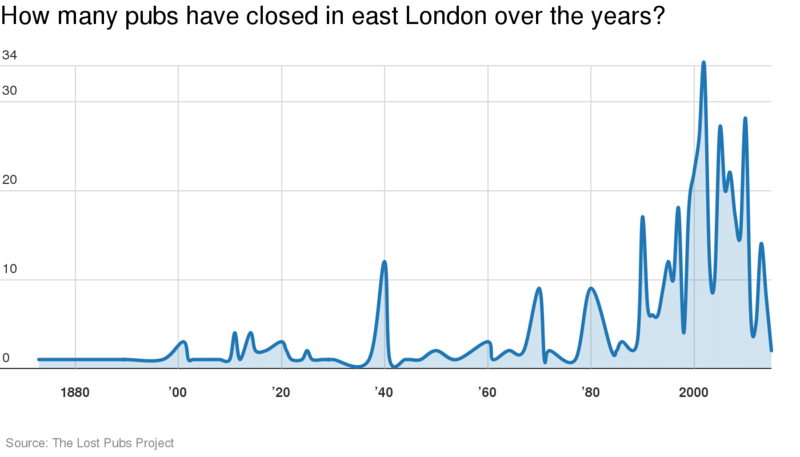 The data clearly shows an explosion in the number of pub closures in recent years, and unless east London suddenly stops becoming cool or the government decides to give free money to everyone, the number probably won’t go down too much. There’s been an explosion in the number of pub closures over the last decade. Granted, at one point there was almost a pub on every street, and obviously times have changed since then. Every area, especially London, goes through changes, and it’s difficult to stop that happening. But still, looking at that map and seeing the string of closed boozers that once made up Kingsland Road is enough to make anyone a little sad. East London may be much cooler and less grimy these days, but that doesn’t mean too much to the regulars who are increasingly finding their locals boarded up and abandoned. Top image by arileu, via Flickr. Published under Creative Commons Attribution 2.0 license. http://bit.ly/1FcgCi – all other pictures by me. Are plane crashes becoming more common?